As of this weekend, it feels like the winter weather has really started to take hold, but that doesn't mean everyone has to hunker down in your Charlotte, NC apartments and start hibernating! 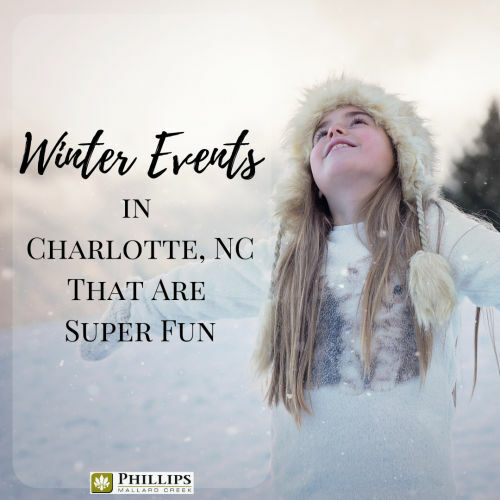 There are so many super fun events going on in the Queen City metro area that you may forget to sleep all winter long! 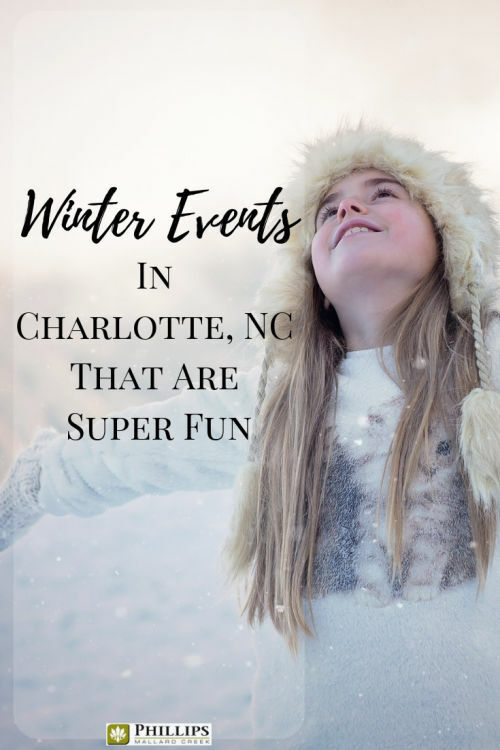 Get ready to break out your sweaters and your mittens because you will definitely be hitting the town once you see this list of events taking place in Charlotte, NC next month! Everything Charlotte is easily accessible from the Phillips Mallard Creek apartment community. This free event will take place at the Harvey B Gantt Center, and it will be an evening of full of music, creativity, and lively conversation. The evening starts at 6 pm with a guided tour of the galleries and the evening will continue on until 10 pm with various different programs and entertainments. The UK comedian, Chris Turner, will be joining the Charlotte Improv Regulars, Background Noise, for an evening of laughter and fun This musical edition of the monthly improv show should also have your toes tapping. The fun will start at 8 pm at the Stage Door Theatre. Tickets are general admission in this intimate venue. This is the largest sale of its kind in the city! The Park Expo & Conference center will be transformed into 80,000 square feet of shopping space with sellers from over 6 states in attendance. It is the perfect place to find gently used and new items ranging from toys to books to clothes and so much more. Make sure you wear your walking shoes because you won't want to stop shopping all day. For the second year, Plaza Midwood will be overrun with adults in onesie pajamas. Your ticket will include a commemorative koozie and tons of drink specials. Make sure your onesie is looking sharp because there will be photographers snapping shots of all the fun. The ImaginOn library in uptown will be hosting this event to help boost reading confidence in 5-11 year-olds. There will be volunteer therapy dogs on hand for the children to read stories to. Reading to the dogs helps improve reading skill while giving the children the confidence they need to become lifelong readers. One Valentine's Day, take your significant other to a Brazilian steakhouse! Chima is offering a special holiday package that includes dinner, champagne, and dessert. You will never forget how amazing your Valentine's dinner was because the restaurant will also give you a keepsake photo. You can probably find a spot for it in your Charlotte, NC apartment. Celebrate the All Star games with over 2,000 of your closest friends hopping from bar to bar around the city. Your ticket price will include a free wine tasting, a commemorative shot glass, plenty of Mardi Gras beads, and drink specials galore. Don't expect to get back to your Charlotte, NC apartment until sometime on Sunday. Head to the Belk Theatre in Uptown for a critically acclaimed production of Miss Saigon. The huge cast of 42 people will be singing and dancing their way through all the original Broadway numbers. Tickets start at $25. During the winter months, the U.S. National Whitewater Center may not be at the top of your list when considering activity choices. This year, however, the USNWC is pairing with some local chefs and breweries to put out the Craft Dinner events. Your ticket price includes 5 oz beer samples and specially paired food items. New Belgium will be hosting the February 22 event, and you can expect things like butterscotch cream cheese, tamarind glazed tofu, and watermelon fruit salad on the menu. This matchup between the Charlotte Checkers and the Lehigh Valley Phantoms will be a special Godzilla Night! There will be Godzilla t-shirts for sale, and since it is a family night, there are online discounts for a bundle of four tickets. After the game, you can try your luck on the ice with the Slapshot Saturday event. Take it back to the 90's at The Underground. SiriusXM is sponsoring this throwback tour with the Gin Blossoms. They will be playing songs from the best-selling album Dizzy Up the Girl in what is being called the New Miserable Experience tour. The Underground is located in the NC Music Factory, and it is a general admission venue. The winter chill may be in the air, but you will barely notice. Even though you won't be spending much time hanging out in your Charlotte, NC apartments the winter weather definitely won't be getting you down this year! Whatever entertainment styles you prefer, the Queen City has got you covered.